God made each body unique. It would be nice if the Fashion Industry would get that memo. Between Clinton and Stacey and ALL of the designers on Project Runway, I fret over each and every piece in my closet. I am down to so few pieces that I could probably pack all of my belongings in two suit cases (and that includes my shoes). The weekly challenge issued over at Amy Bayliss seemed like an impossible task at first glimpse. I almost commented that I would not be participating, but decided that with a little creativity, this might be the greatest fashion challenge I have ever undertaken. Outfit #1 – The brown shirt and brown printed skirt. The skirt started out as a halter dress that was handed down to me. I LOVED the print, but there was no way my . . . um, curves were fitting into the halter portion. I cut off the halter, added a little hem and now I have a cute skirt to go with my brown shirt. All I need to make this the perfect outfit is some hot, high heeled boots. Outfit #2 – The blue pants and printed shirt. The shirt was the major change in this outfit. It also started out as a dress. This time it was the lower half that I did not like. I just cut it off, hemmed the bottom and added a pair of dress pants. I’ll finish this outfit off with some black and silver pumps. 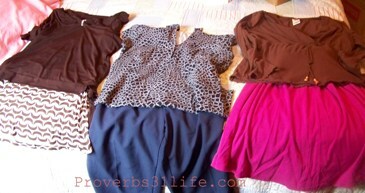 Outfit #3 – The pink skirt and brown shirt. The material of this skirt is amazing, but it started out as a tank dress. I liked the fit and the feel, but the skirt was too long on the dress and I prefer separates. The scissors again came in handy. I cut the tank portion of the dress off and hemmed the skirt to be right a knee level. I paired the skirt with a brown, thrift store find that I have had in my closet. I think the brown boots I will be getting for outfit #1 may also rock outfit #3. Take the challenge. Use the things that you have – or recreate the clothing you have – to make three new outfits. I thought about that – and about taking a before and after shot – but I thought about it too late :D. I was just excited to get into the game this round! Love those outfits. Wish I had the knowledge on how to turn something from one thing to another. Just not that creative! The first outfit,laying down, not on you :), is my favorite, too. It is amazing how things laying down or on a person look so different. I like the brown and pink solids together, bold, but pretty. I am amazed that you took all of those dresses and turned them into pieces that you wear and enjoy. That is inspiring. Hey Misty – thanks for stopping by. I confess that the first outfit is also my favorite. As for the pink, I have decided that they work with just about any color 😀 A bold piece with a neutral print should always be able to work. Thank goodness for all of the fashion shows or I would never have considered it myself.